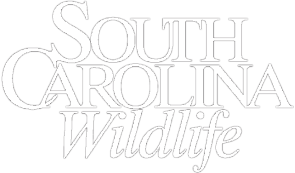 Trip Location: The Saluda River; specifically, from Blacks Bridge at the upper end of Lake Murray to the Buzzard's Roost Dam at Lake Greenwood. Trip Mission: Exploring the river, taking pictures, and trying to make it all the way to the dam. Trip Difficulty Rating: Moderate. A river map and some boating experience is a must. The river can be a little confusing, especially locating the right channel when you star getting near the dam. There are a lot of sunken trees near the shoreline, and more rocks the closer you get to the dam. Take a lunch/snacks/water, extra gas, bug spray, life jackets, anchor, etc. Most importantly take a camera. 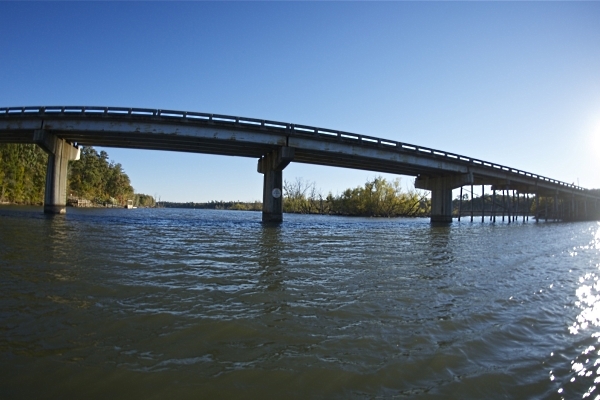 If You Go: Blacks Bridge is located on Highway 39, approximately 5-6 miles south of Prosperity. The intrepid Frog Level going into the water at the DNR landing at Kempsons Ferry Bridge. This ramp can be a little tricky because it is so steep when the water level is down. 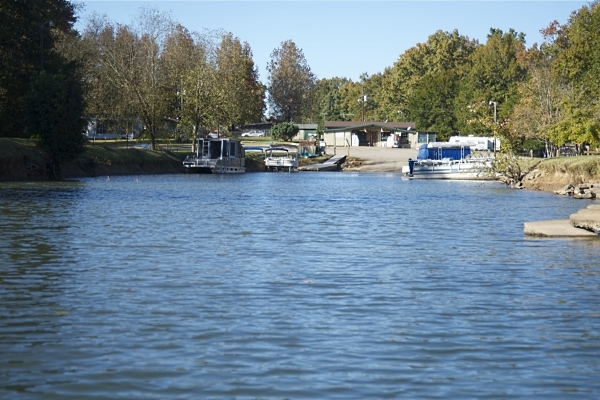 The parking is limited, as this is a popular place for fishermen to put their boats in when they want to fish the upper river. During the course of making a couple of trips up the river to the dam and back, one thing I discovered is that the river is much more than I had expected. 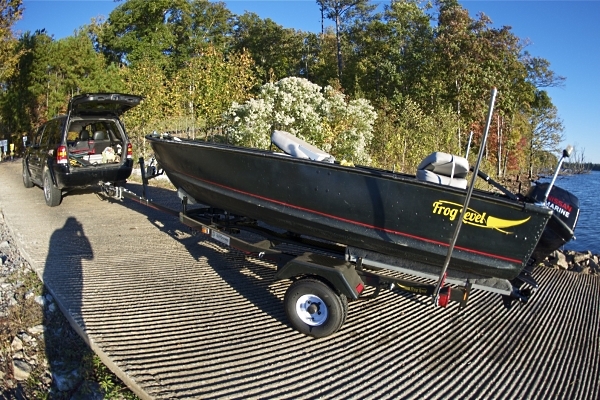 Depending on the day of the week you explore, you will encounter all types of watercraft. There are many places to put ashore for lunch and pictures. Further up the river, there are a couple of sand/gravel beaches where people anchor to enjoy swimming from their boat, and there are some just floating along fishing for supper. 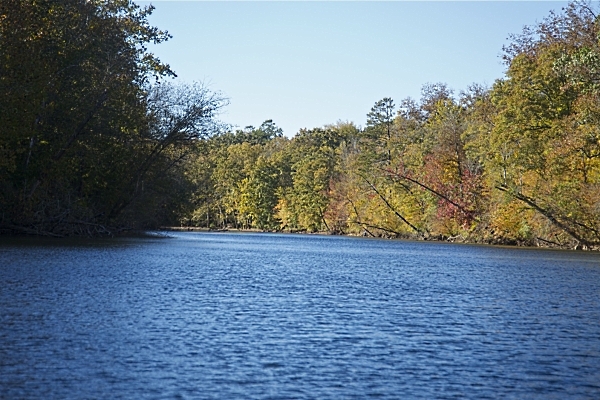 The Saluda is more relaxed than the hustle and bustle of the "big water" on the lake. It has a remoteness, especially above Kempsons Ferry Bridge, that fosters serenity. It is a long enough trip to make it a real all-day adventure, especially in my junkyard rescue boat. I named it Frog Level after the nickname of Prosperity. The boat gives me the "close to the water feel" for better pictures and the twenty-horse Nissan motor gives it plenty of zip. Plus, I have the ability to row into shallow water for pictures. I had expected to see miles of houses along the river, but what I found instead in its upper reaches was real wilderness and a remoteness that supports a host of wildlife, from majestic bald eagles all the way down to the water level with slider turtles sunning on half sunken tree limbs. 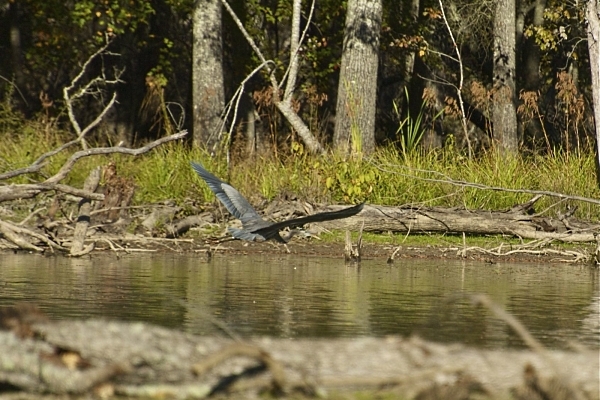 For a newbie on the river I felt like I had ventured into a photographer's wildlife paradise. My wife and companion in adventure helps spot some of the interesting wildlife. If I want to get up the river quickly I put my boat in at the DNR ramp at Kempsons Ferry Bridge and head west up the river from there. If I have more time I put in at the ramp on the southeast side of Blacks Bridge on SC 391. 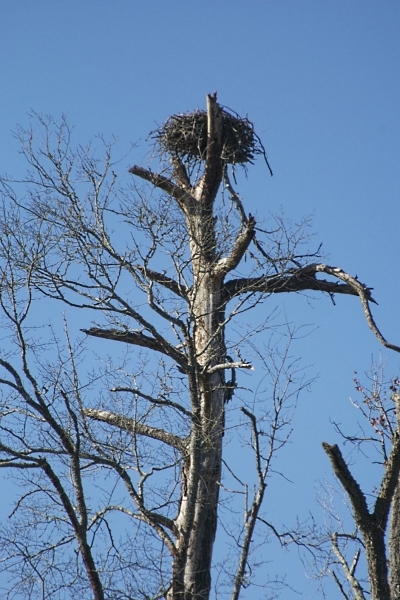 On this trip, we spotted an abandoned Osprey nest in a standing dead tree in the middle of the river about a mile west of the Kempsons Ferry Bridge. Further on up the river where it narrows down I spotted a heron sitting in the weeds on the shore. I let the boat drift toward the bird, but as soon as I was about to take the picture, up it went. It turned out to be a flying picture instead of a portrait shot. 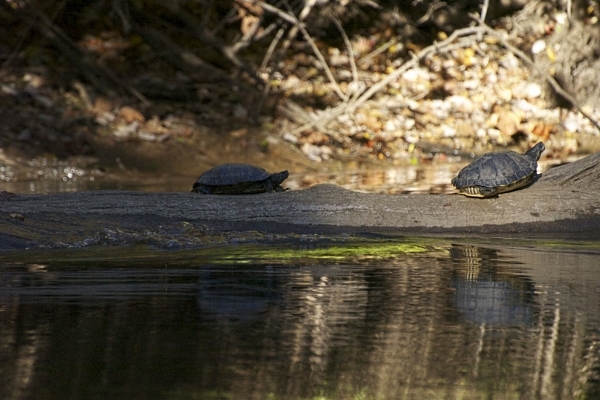 Here's two of the dozens and dozens of slider turtles we often see getting some late fall sun on the south side of the river. They are a little tough to sneak up on for the "perfect" turtle picture. As soon as I get close they slide into the dark river water. It took several tries to get this shot. I also have lots of empty log pictures. 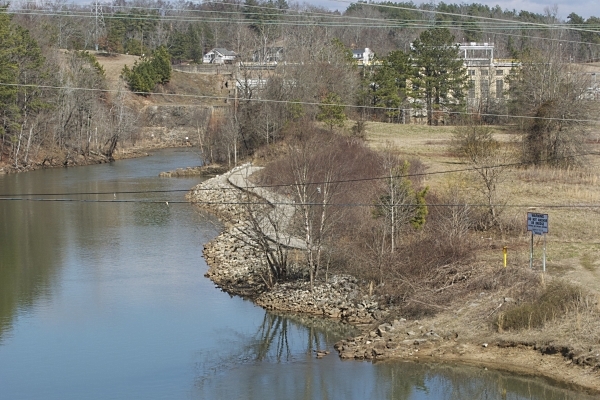 This is the canal entrance to the popular Saluda River Club, about 5-6 miles up the river from Blacks Bridge. There are campsites there, a launch, and several year-round homes. After many miles of wooded shoreline it just pops up on the northern side of the river. It is easily reached by car off of Route 121 in the Silverstreet area. 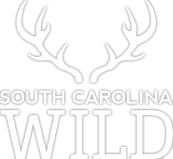 There is a restaurant there that a DNR conservation officer told me about on previous trip. He likes to call ahead and order a hamburger to pick up on his way up/down the river. Next time I will give it a try. 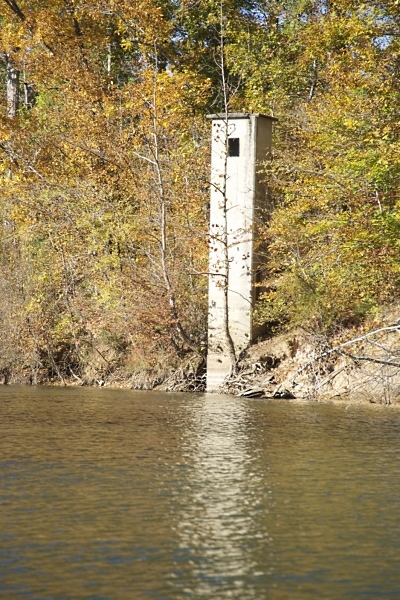 Just above the S.C. Route 121 Bridge, a concrete tower sits on the northern shore. A very curious structure that makes me ponder what it was built for. There is an abandoned bridge near there also, so I wonder if they are connected. There's another somewhat mysterious man-made feature along this part of the river. 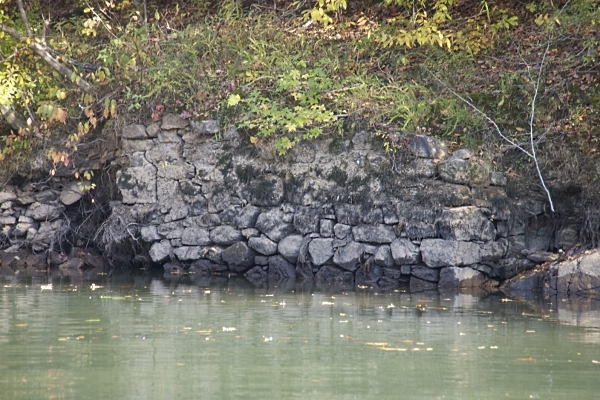 This fifteen-to-twenty foot stretch of very-well-made stone wall runs along the southern shoreline near the 121 Bridge. There aren't any other signs of other structures. Purely a guess on my part, but, because the area is so isolated, perhaps it once might have been a docking site for farming or logging? This is a shot of the wonderful foliage a short distance from the hard right turn near the end of this trip that takes a traveler the final distance to the dam. The river level was low when this picture was taken, and it is extremely rocky in this area, so I couldn't get any further upstream. When the lake level is up it is possible to keep going and get a view of the dam. Be careful though, even at high water, the channel is windy and narrow, so tilt your motor to the shallow running height to avoid hitting damaging unknown objects. 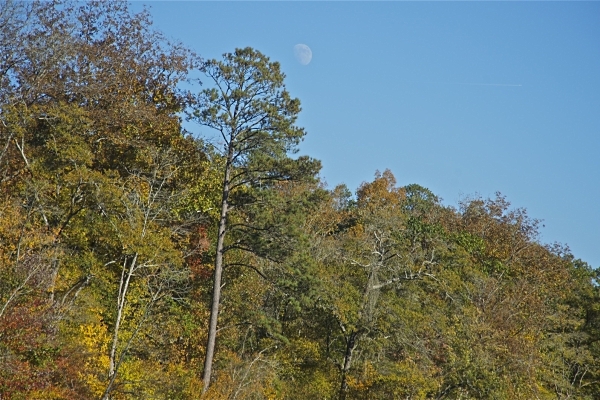 On a return trip in November, because we were getting shorter fall days the moon had come up on the northeast side while the sun was setting on the southwestern side of the river below the 121 bridge. I almost missed it as I was looking for wildlife to photograph. I got this one shot, and turned around for another chance but by then the moon had gone behind the trees. 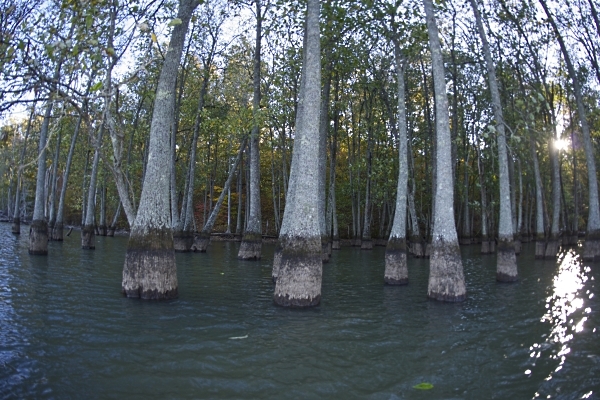 This tupelo grove is about a mile west of the Kempson Bridge launch on the southern shore. From the shore, the furthest tree into river is about 300 feet, but most of them are much closer, probably in 100-foot or less range. They truly are majestic. The tallest trees get up to about 144 feet, but the average is about 30-50 feet with a crown of 15-25 feet. Tupelos are a favorite of wood carvers, but probably more than anything else,these trees are noted for their 'Tupelo Honey,' a light mild tasting honey. Their red fall foliage also makes them very a popular ornamental tree. The watermarks on these trees show how low the water level gets in the fall. When I first visited this site in the summer, the water was much higher, and my motor did not touch bottom, but this time it did. I really stirred up some mud. When the lake level is normal there is plenty of water to maneuver, and it also appears to be a popular fishing site. 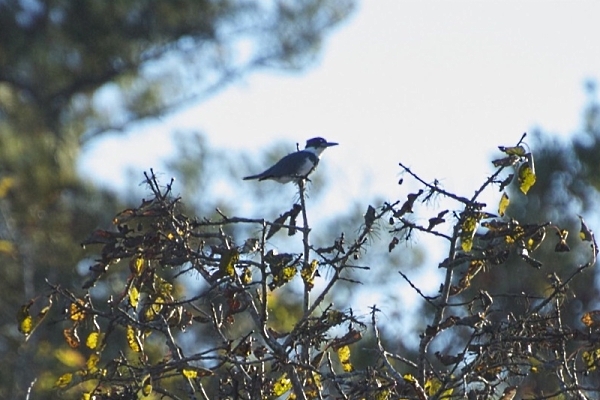 If I am reading my Sibley Guide for Birds correctly, this is a belted adult male Kingfisher. He was roosting at the top one of the Tupelo trees further away from the main grove near the shore. Because he blends so well with the fall foliage I almost missed him, and a second after I took this he was heading down river in a flash. Headed back downstream, the view from atop Dysons Bridge, where S.C. Route 34 crosses the river near Chappells, includes a railroad trestle in the distance. 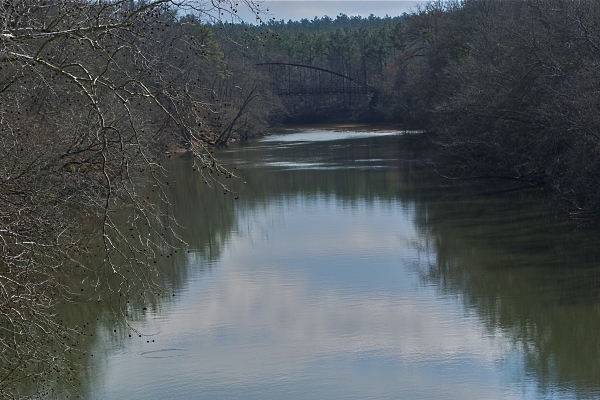 A few miles past the trestle, the river takes a big turn and begins winding its way east towards Lake Murray.